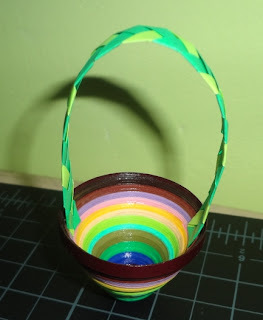 I was always fascinated by Paper Quilling but was never brave enough to try it but yesterday I decided to try it and luckily I found a very good tutorial at Quilled Creations, their easter basket tutorial. It was easy and very informative hence I opened up my box of quilling materials and immediately decided to make it. There was one problem though, I do not have curling coach, but then I made a new JUGAD curling coach, I will tell about in later post. The pics are taken at night so the colors may not look that attractive but they are looking lovely. I did some variation from the original tutorial, for example I used thinner strips, instead of 6 colors with 4 strips of each, I used 12 colors with 2 strip of each. I also added Mod Podge to give the glossy effect and to protect the strips. 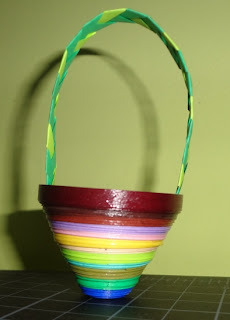 Now very soon I will give another try to quilling, but for now more focus towards my kids health. wow .. you can quill too ? very neat for the first time! That turned out neat.... Kudos on your first attempt!